Most of our political representatives, from school boards to Congress, are elected by voters who have been sorted into districts. Redrawing the boundary lines for these districts is called redistricting. Under the U.S. Constitution, redistricting happens about every ten years, after each decade’s U.S. Census, to adjust the districts and make them roughly equal in population. In North Carolina, elected representatives are authorized to redraw the district lines for their own governmental body. So, school board members draw the school board lines, City Council members draw the city council lines, and state legislators in the N.C. General Assembly draw the state legislative and Congressional district lines. What is redistricting and how does it affect you? Learn all about redistricting, why it matters, and what you can do to influence it. How Does Redistricting Affect Me? The way a district’s lines are drawn may include or exclude certain people. These decisions are often made based on party affiliation, race, or other factors, and can affect who gets heard, whose interests are most represented, and who can win the next election. Too often in redrawing districts, elected officials focus on their own re-election rather than the people’s interests. Redistricting then becomes a secretive process focused on advancing partisan interests; it becomes a way for politicians to pick their preferred voters and secure their power. Gerrymandering is the deliberate drawing of districts in a way that maximizes the power of politicians. Gerrymandering may result in oddly-shaped districts designed to greatly increase or decrease a certain kind of voter (e.g., Black voters or Republican voters). 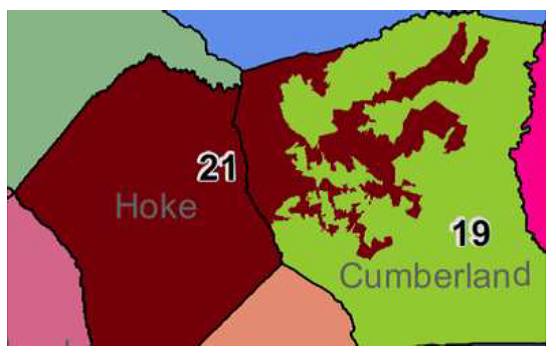 For instance, to the right, legislators drew former Senate District 21 (since redrawn) with tentacles that added black voters from Cumberland Co. to make District 19 more white. Legislators drew Senate District 21 with tentacles that added black voters from Cumerland Co. to make District 19 more white. Legislators drew District 14 to pull in black voters and make District 18 more white. How Can We Improve the Redistricting Process? Protect voters of color by drawing districts that reflect the requirements of the Voting Rights Act and Equal Protection Clause of the 14th Amendment. Invite robust debate from community members, academics, and other stakeholders, and incorporate their feedback in the creation of districts. Reject partisan or racial gerrymandering of districts. What’s the Latest on NC’s Districts? 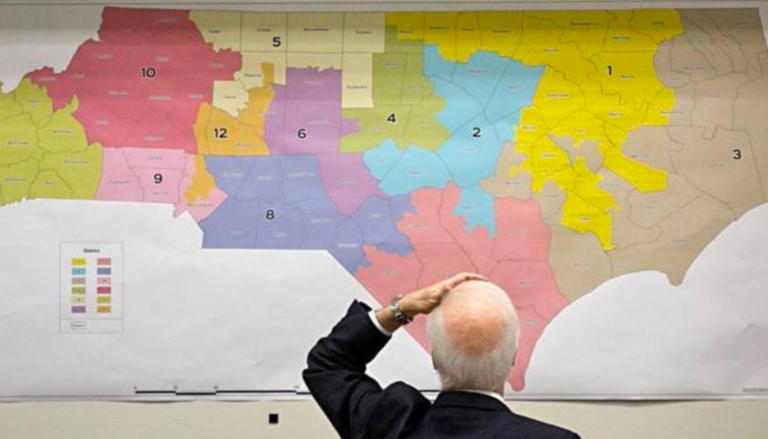 Despite two federal court rulings declaring North Carolina’s Congressional districts unconstitutional partisan gerrymanders, North Carolinians voted in the same Congressional districts in 2018 that were used in 2016, and it is not clear when they will be corrected. In 2016, the U.S. Supreme Court found that North Carolina’s 1st and 12th Congressional districts were illegal racial gerrymanders, requiring the General Assembly to draw new districts. But those new legislatively-drawn maps, which were used in 2016, were then challenged as partisan gerrymanders in Common Cause v. Rucho. Unlike racial gerrymandering, which places voters in certain districts based on race, partisan gerrymandering places voters in districts based on which party they have historically voted for, with a similar intent of reducing competition and benefiting one party. In January 2018, a federal court ruled in favor of the Common Cause v. Rucho plaintiffs and ordered the legislature to draw new districts. But the U.S. Supreme Court stayed (stopped) that order, so it could hear similar cases from Maryland and Wisconsin. Unfortunately, no standard for measuring the legality of a partisan gerrymander came from the U.S. Supreme Court in 2018, and Common Cause v. Rucho was sent back to the lower court for reconsideration. In August 2018, the federal court again found our Congressional district maps to be an unconstitutional partisan gerrymander, and the case is now before the Supreme Court again, where arguments in the case will take place in March 2019. Still, it remains unclear whether the partisan gerrymander will be remedied by the 2020 election. In 2018, North Carolina voters elected state legislators from new districts, redrawn in response to a 2017 U.S. Supreme Court decision in Covington v. North Carolina. In Covington, a federal panel found that 29 state legislative districts were illegal racial gerrymanders. 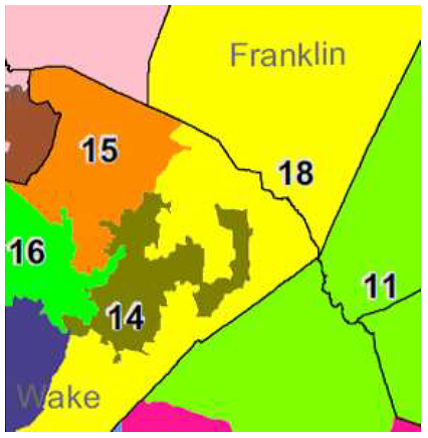 When the General Assembly redrew the maps to comply with Covington, they also redrew districts in Wake and Mecklenburg counties that did not need to be altered in order to correct the unconstitutional gerrymanders – violating the N.C. Constitution’s prohibition on mid-decade redistricting. In February 2018, Democracy NC, NAACP, the League of Women Voters, A. Philip Randolph Institute, and individual plaintiffs challenged the four Wake County legislative districts in a new state court case, NAACP v. Lewis. In November 2018, the courts agreed with plaintiffs that those four districts violated the North Carolina Constitution. Now lawmakers have been tasked with redrawing the districts by July 2019, in time for the 2020 election. Despite the victories in Covington and NAACP, North Carolina’s 2017 legislative maps were still drawn in ways that favored one party’s voters. In November 2018, Common Cause, the N.C. Democratic Party, and a group of individual voters, filed another lawsuit, Common Cause v. Lewis, which challenges legislative districts statewide as partisan gerrymanders that violate the North Carolina constitution. This latest suit asks for the districts to be redrawn for the 2020 election, and is scheduled for trial in July 2019.